Christmas breakfast can be a bit of a pickle, often an afterthought on the big day. With the thought of all the food to come later, turkey preparations to do, even the occasional present wrapping in my house (I know, terrible!) - finding the time to sit down together and eat something delicious can be more difficult than it seems. We usually go for a scrambled egg affair, cooked up by Dad and served with a glass of Bucks Fizz (it is Christmas, after all! ), but this year I've come up with something different. Crumpets are one of my all-time favourite breakfasts, and it suddenly dawned on me - why not make them for Christmas day and give them a festive twist? Crumpets are true joy. Dotted with little holes, the surface is perfect for drenching in butter, and I love how it melts and drips through the tunnels creating sweet, buttery pockets. I'm using a sweet cinnamon butter and boozy cranberry sauce to give these a festive feel. Another thing crumpets have in their favour is time. Fresh bread can be time consuming and unachievable on a busy day, but crumpets require just 45 minutes of proving. 45 minutes! And just the one prove. And no kneading. How can you NOT make these? Bicarbonate of soda is what is to thank for that ridiculously quick transformation from gloopy mixture to bubbled dough. Combined with yeast, both raising agents work together, creating a beautifully light and risen mixture. Once you've mixed your ingredients together, cover with clingfilm and set to one side. My top tip here is to label that clingfilm. I always forget the exact time I leave my dough, and for crumpets with a short rise, it's important not to over-prove or you won't get those authentic tunnels. In a large mixing bowl, combine the flour, yeast, salt, sugar and bicarbonate of soda. Make sure you don’t place the salt directly on top of the yeast, as this might kill it. Heat the milk gently in a small saucepan until warmed through (you don’t want it to boil). Slowly add the milk into the dry ingredients, whisking all the time until you have a consistency of thick double cream. Cover with clingfilm and leave for 45 minutes. Heat a flat griddle pan or frying pan over a medium/low heat and place one or two crumpet rings (or however many will fit) into the pan. If you don't have crumpet rings, you can always use round cookie cutters or the outside of a small springform cake tin. Brush the inside of the moulds with a little butter, then spoon batter into the rings so it comes about halfway up. Don't be tempted to overfill the moulds, or it will be impossible to cook the crumpet all the way through. Bubbles will start to come to the surface and burst. When the surface looks fairly dry (this should take around 7-8 minutes, or a little longer for larger crumpets), remove the crumpet ring and flip the crumpet over. Cook on the other side for 1-2 minutes, then transfer to a wire rack. Repeat the process with the rest of the crumpets, until all the batter is used up. These are best enjoyed warm, straight from the pan, but are great warmed in the toaster too. They will keep for 2-3 days. In a small bowl, beat together the softened butter with the cinnamon and the brown sugar. Cut a square of brown parchment paper and spoon the cinnamon butter into the centre. Roll into a sausage shape and chill for at least 2 hours, or until hardened. 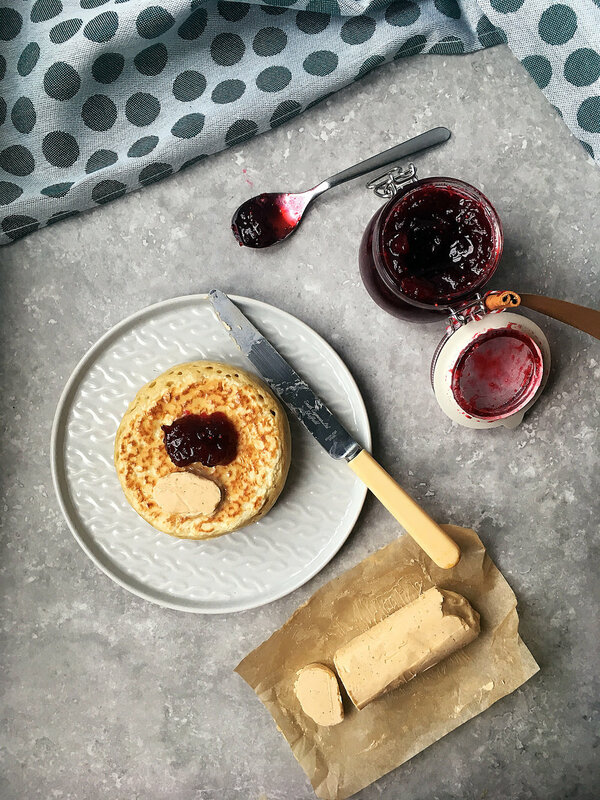 Serve slices on top of hot crumpets and top with a dollop of cranberry sauce! Remember to send me your pictures if you decide to give these a go!